Since we've entered the digital era, the way we read and consume books has completely shifted. The advances in technology has led to many of us dropping the physical, hard copy book in favour of a digital eBook. But how has digital changed the way we read, and learn? Books definitely have a place in the digital era. 32% of children read daily for pleasure and 72% will read a book weekly for pleasure. As much as we love anything digital and social, preserving books is still of the upmost importance. Mental Stimulation: Just like any other muscle in the body, the brain requires exercise to keep it strong and healthy, so the phrase “use it or lose it” is particularly apt when it comes to your mind. Stress Reduction: No matter how much stress you have at work, in your personal relationships, or countless other issues faced in daily life, it all just slips away when you lose yourself in a great story. Knowledge: Everything you read fills your head with new bits of information, and you never know when it might come in handy. The more knowledge you have, the better-equipped you are to tackle any challenge you’ll ever face. Improved Focus and Concentration: In our internet-crazed world, attention is drawn in a million different directions at once as we multi-task through every day. In a single 5-minute span, the average person will divide their time between working on a task, checking email, chatting with a couple of people (via gchat, skype, etc. ), keeping an eye on twitter, monitoring their smartphone, and interacting with co-workers. This type of ADD-like behaviour causes stress levels to rise, and lowers our productivity. Tranquility: In addition to the relaxation that accompanies reading a good book, it's possible that the subject you read about can bring about immense inner peace and tranquility. The reason we don't tell stories on cave walls anymore is because it's not practical. Books are in no way obsolete. It's an old method of storytelling but it's got many practical benefits and countless educational and health benefits. Tablets in classrooms are becoming a more and more regular feature of the modern day classroom but why? When many people think of the iPad they probably think of children playing on Angry birds or Farmville. However iPads and schools really do go hand in hand. In the last five or six years tablets have become more and more accessible to people and the numbers of iPads used in schools have surged. So why do Tablets and schools go hand in hand? 1. World's biggest library: The three largest publishers, producing 90% of all textbooks used in schools are all partnering with Apple to sell digital versions. Apple gives you access to near enough every book in the world. What a resource to have in the classroom. 2. Interactive textbooks: With apps such as iBooks Author, students and teachers can create interactive textbooks featuring 3-D graphics, videos, and the ability to take notes. It has increased the level of learning through interaction and participation. This really adds a new a dimension to storytelling and allows the reader to interact with the story. 4. Personalise lessons plans for students with disabilities: By using the touch screen capability students who lack motor skills can actually watch their finger move and write directly on the screen, this greatly improves their fine motor skills. 5. Budget friendly: You no longer have to replace old textbooks, digital updates make this cheaper, easier and faster. Teachers also don’t have to worry about damaged or lost books as well, all of this saving money in the long run. 6. Speaking 'their' language: Students these days use tablets and mobile devices from an early age, some as early as 1 or 2 years old! By the time they are in school it’s second nature to use a tablet or mobile device. The iPad will keep their attention and resonate with students by aligning with how the new mobile generation wants to learn and communicate. 7. Ready for tomorrow: Students today need to be technology literate. iPads and tablets play a huge role in preparing our students for college, university and eventually their careers. 10. Ease of Use: iPads particularly seem to be extremely easy to use right out of the box. Apple has given the iOS a very streamlined, organised feel; you have everything you need, and it works! It would be easy to write hundreds of reasons why iPads are so perfect in modern day classrooms. They are the essential teaching tool, which makes storytelling more of an interactive experience for the whole class. They are over 65,000 educational apps on the App store, so it's easy to get lost, the app store can be a bit of a minefield if you are not careful. So take to make it easy for you here are some our hottest apps for iPads in school to enhance your storytelling experience in the classroom. 1. iBooks Author: iBooks Author is an amazing app that allows anyone to create beautiful iBooks Textbooks — and just about any other kind of book — for iPad and Mac. With galleries, video, interactive diagrams, 3D objects, mathematical expressions and more, these books bring content to life in ways the printed page never could. 2. Nosy Crow Interactive stories: British books and apps publisher Nosy Crow has made a succession of beautiful fairytale apps, all with a strong eye on encouraging reading, not just tapping on interactive whizziness. Jack and the Beanstalk was their best effort yet, blending storytelling and light gaming with the company’s now-familiar voice narration from children, not grown-ups. This is the future of storytelling the super pack is £18.99 but this is a fantastic app. 3. ScratchJr: Scratch is one of the most popular languages used in schools when children are learning computer programming schools. ScratchJr took the idea to tablets this year, from a team including MIT, which was responsible for Scratch. It’s an app that gets children to create stories by slotting together blocks of code: fun and creative. 4. 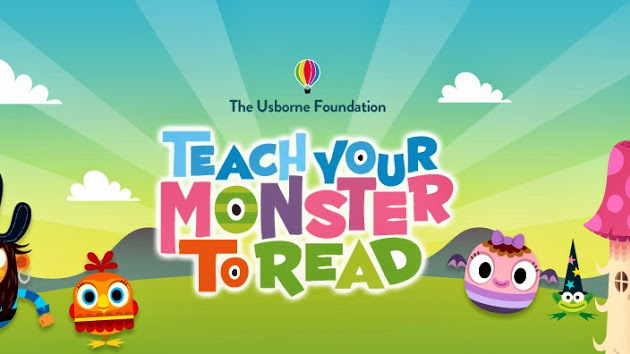 Teach your monster to read: Based on the well-regarded educational website, Teach Your Monster to Read was an excellent app introducing children to synthetic phonics, as a complement to their learning in the classroom. Its fun, accessible games introduced the letter sounds although – important note – it’s not describing your kids as monsters. Instead, teaching the in-game monster to read is key to the app’s structure. 5. iBooks: iBooks is an amazing way to download and read books. iBooks includes the iBooks Store, where you can download the latest best-selling books or your favourite classics — day or night. Browse your library on a beautiful bookshelf, tap a book to open it, flip through pages with a swipe or a tap, and bookmark or add notes to your favourite passages. 6.StoryKit: This is an awesome app that allows users to easily create an electronic storybook via illustrations by drawing on the screen, using pictures and text, and recording audio to attach to stories. This is a great app for children to actually create a story, rather than just read one. What about Kindle / Ebooks and other tablets? There is clearly a wealth of technology available to us and it would be naive to think otherwise. The first electronic book was published back in 1949 believe it or not! Electronic books have been around a very long time. The fantastic thing about e-books is that they are a simple tool. E-Books are still hugely popular! However they do not have the same interactive features as iPads for classrooms. The real bonus for E-books is that their core design and purpose is an electronic book. iPads and tablets are built to be everything from your wallet to your flight simulator! With this in mind many people tend to strive towards E-books for a reading only tool. Budget E-books could be a really handy tool for schools. With access to millions of books, pupils could really benefit for classroom e-books. E-books also have no apps or other functionality for children to perhaps get distracted. There is no risk to viruses or dangerous apps. It's a simple but effective reading companion and classroom tool. They are now hundreds of tablets available to buy for a very reasonable cost on several different operating systems. So why not use a different tablet for classrooms? These tablets have a host of apps (many more than Apple) and much cheaper than the iPad with great functionality. We are sure that many of these tablets could work for your school but when compared against the iPad they are just some obvious shortcomings. iPads and Apple have specific contracts with schools and specialise in the educational market. With a host of educational apps and software the iPads is really the perfect tool for educational institutions. The App store and Apple products are far less prone to malware or viruses. The app store has very rigid and thorough procedures to get an app created, even more so if it is placed in it's educational market. Apple products provide that extra level of security with schools. Apple products have long warranties and have that extra level of protection for when a tablet may get broken in a classroom. Apple and the iPad just provide that level of class and provide a really smooth user experience. The iPad has fantastic durability and Apple products are tried and tested in schools. We recommended the iPad for this reason. If your school does use different tablets we would love to hear from you in the comments section at the end of the blog! Reading will continue to be important in education but it will evolve as technology advances. It is time to be unafraid of the digital age, and explore new technology and techniques that could better our children's education. We would to love to hear your thoughts and comments on how the digital age has revolutionised the way we read and learn! How is your child using social media? A safety guide for parents.